Introduction. 1. Mental Health Services and Me: What Worked, and What Didn't. Janet Christmas. 2. Coping with Depression: Positive Advice for Aspies. Debbie Allan. 3. My Fur-lined Bucket: Alternative Methods of Dealing with Mental Health Issues. E Veronica Bliss. 4. This Aspie Life: The Undiagnosed Aspie Experience. 8ball. 5. A Colourful Rainbow: Embracing Autism as a Neurological Difference, Rather than a Mental Health Disorder. Melanie Smith. 6. Getting the Right Diagnosis, and its Impact on Mental Health: Is this the Best the NHS Can Do? Cornish. 7. Positive Mental Attitude: Coping with Setbacks, Knowing Your Own Strengths, and Finding Happiness Any Way You Can. Dean Worton. 8. "It's all in your head": The Dangers of Misdiagnosis. Neil Shepherd. 9. A Fairytale Life It Isn't (AKA Chapter 9): Alcohol, Self-harm, and the Benefits of Exercise. Alexandra Brown. 10. "Getting My Life Back": A Mother's Struggle to Get Mental Health Services for Herself and Her Son. Anne Henderson. 11. A Week in the Life Of: Strategies for Maintaining Mental Health as an Aspie. Steve Jarvis. 12. My Plastic Bubble: Dealing with Depression, Anxiety, and Low Self-confidence. Wendy Lim. 13. The Art of Being Content: Asperger Syndrome, Buddhism, and Me. Chris Mitchell. 14. A Journey Looking for Answers About the Way I Am. Anthony Sclafani. 15. A Label that Fits: Diagnoses, Self-harm, and Mental Health. Natasha Goldthorpe. 16. Through the Looking Glass into Lynette Land: Making Humour Work. Lynette Marshall. 17. Mental Health and the Workplace: Dealing with Criticism, Coping with Stress, and Taking Control of Your Environment. Dr. Christopher Wilson. E. Veronica Bliss has over 20 years' experience working with individuals on the autistic spectrum, and has been working as a solution focused psychologist for the past six years. 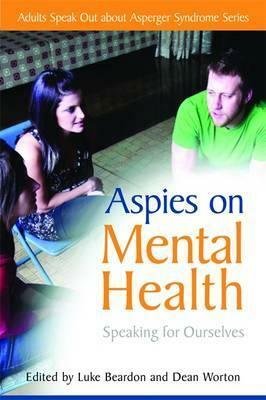 Chris Mitchell was diagnosed with Asperger's Syndrome in 1998, when he was 20 years old. Having completed an MA (Hons) in Information and Library Management, he currently works at Durham County Council. He is an active advocate for raising awareness of the positive aspects of AS, giving talks, seminars and workshops throughout the UK. He also offers mentoring and support services for school leavers and students entering higher education with AS. Chris has written an autobiography of his own experience of AS, entitled Glass Half-Empty, Glass Half-Full: How Asperger's Syndrome Has Changed My Life and practices meditation in his spare time.